Which comes first in a law firm, the chicken or the technology? This is an age-old question: Does innovative technology lead to creativity in business processes, or do expanding business processes stretch existing systems and create the need for new technology? It might be easier to answer another age-old question: Which came first, the chicken or the egg? Actually, that question appears to finally have a definitive answer! There’s a familiar arc to the adoption of any new innovation, including new technology. Sociologist Everett Rogers demonstrated over fifty years ago that social systems embrace new ideas in a predictable fashion, with a small minority of early adopters paving the way for the many late adopters. 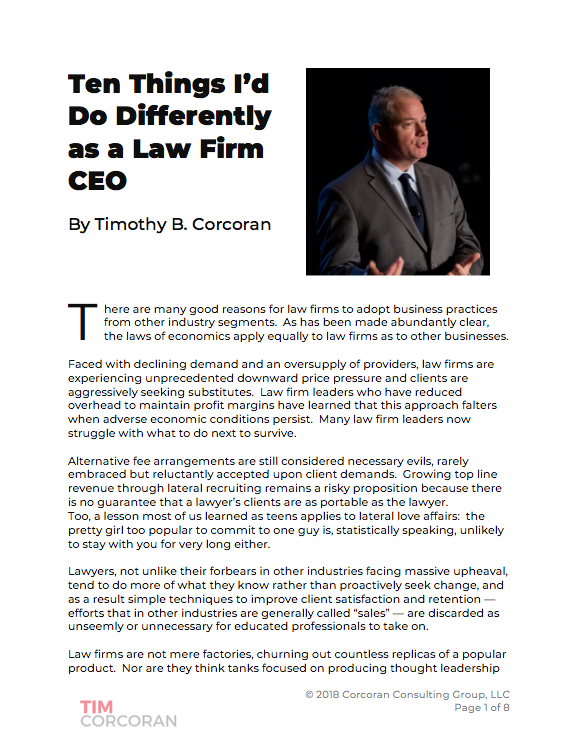 In the typically risk-averse culture of a law firm, cutting edge innovation is even more challenging to introduce, as "the race to be second" prevails. Anyone who has heard a lawyer object to a new idea by posing, "How many other law firms have used this idea to address this problem?" knows of what I speak. Law firms pose additional hurdles. For example, with heavy reliance on hourly billing the introduction of technology that increases efficiency and therefore reduces billed hours is typically avoided unless or until clients demand it. So wouldn't a partner's quest for a technology solution, a gesture of willingness to try new things, be a desirable outcome? Well, sort of. Let's pat the partner on the back for thinking outside the box. But ideally, we should seek a better way of doing things, not seek a new tool to do it for us. And therein lies the challenge. This is why I resist the technology question in early discussions of Legal Project Management. Our objective is to find new ways to incorporate client input into our matter, so that we have common expectations about scope, timeline and budget; we want to establish a common understanding of the elements which may quickly grow out of scope so we can keep an eye on them; we want to know what constitutes a "win" for the client, and how they calculate this win; we want to communicate change quickly to minimize surprise, and so on. All of this is a mindset, not a technology. Whether we buy a fancy LPM toolkit (and there are some good ones out there), hire some certified Legal Lean Sigma project managers, or create a project plan in Excel and a Gannt chart made of note cards pinned to the wall, we can achieve the same outcome. Of course, once we've become accustomed to this mindset to managing projects, it makes perfect sense to automate certain activities, using technology to smooth the way. But if we approach LPM like CRM, and try to find a technology answer to "do it for us because we're busy practicing law" then we will fail. I acknowledge that sometimes a "product demo" of a tool used in certain disciplines can be helpful to get the creative juices flowing. With LPM, such a demo can help illustrate how budgets are prepared and communicated with clients, or it can highlight the high proportion of tasks that are repeatable in what partners perceive to be bespoke matters, proving that even unique matters have some element of predictability. But for me, the worse possible outcome is a product demo that induces the lawyers to invest in a new tool and then go back to the way they've always done things. The tool by its mere presence won't drive change. This is evidenced by the number of law firms who build or buy sophisticated new tools that no one ends up using, so they end up calling me to help get the partners on board by backing up and explaining the business rationale behind the new tools. In the law firm chicken and egg question, business process comes first and technology comes second. Otherwise, we run the risk of ending up with egg on our faces.